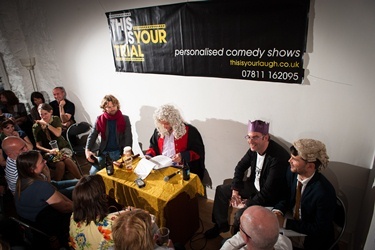 Brian Inkster was put on trial, for a laugh, at the Edinburgh Fringe on 9th August 2013. 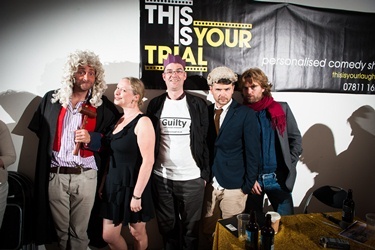 The Judge was Tim FitzHigham, Counsel for the Prosecution was Barry Ferns QC and Defence Counsel was Trevor Lock QVC. 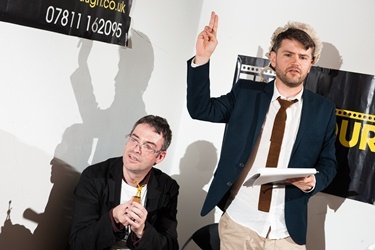 The venue was Heroes at Bob's Book Shop in South College Street in the shadow of Edinburgh University's Old College where Brian, coincidentally, studied law. Bob Slayer presided over the premises and ensured that Foxy Blonde was in plentiful supply. 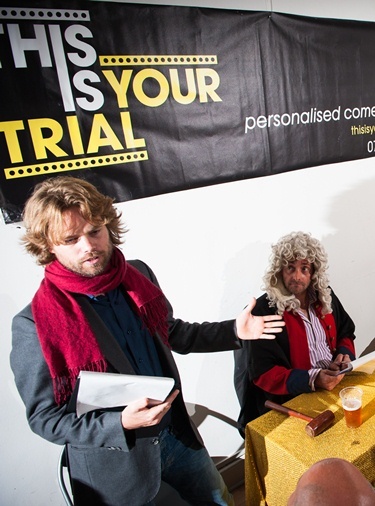 Judge FitzHigham indicated that he had been advised that Brian Inkster looked like Nigel Short although he thought Nigel to be better looking. This lead onto discussion concerning Brian's one time prowess as a chess player. Barry Ferns QC argued that the way Brian Inkster was gearing up his life was treasonous. He was a power crazed socialite and social media junkie. He will stop at nothing to control and be surrounded by people who completely worship and adore him. He even had paparazzi with him at the trial, so unable is he to live without someone constantly documenting his life. When not documenting his own life other people are. The first witness for the prosecution was Valerie Smith (nee Manson): A fellow Shetlander and one time University flatmate of Brian's. Valerie described Brian as being a "basic" Shetlander with a pudding bowl haircut who wore Fair Isle ganseys (i.e. jumpers) and drank McEwans Export when he arrived in Edinburgh to study law in 1985. The transformation from head down was explored with a new haircut and becoming a semi-vegetarian, tango dancing, chilled wine drinker. First signs of megalomania was Brian being "pretty puffed up" about becoming President of the Edinburgh University Orkney & Shetland Students Association and "swishing in and out of rooms". Trevor Lock QVC pointed out that, as it had been shown by the prosecution, Brian was a humble man at heart who came from basic origins. But is it a crime to want to better yourself? Is it a crime to want to be the best that you can be and be a leader of men and women in a democratic elected way. Brian is a man of the people. Everyone knows Brian. He practically invented the 21st century legal profession as we know it now here in Scotland. He invented YouTube, Twitter and the man bag. He may swish in and out of rooms but he swishes for the good of the common man. As an example of this Trevor Lock QVC asked for someone to be taken off the street at random to see if they knew Brian. As it turned out Lewis Schaffer was passing Bob's bookshop wearing an Edinburgh University Orkney & Shetland Students Association T-Shirt. He recalled their time at Edinburgh University together but said Brian could have changed - he may even have become a lawyer for all he knew! 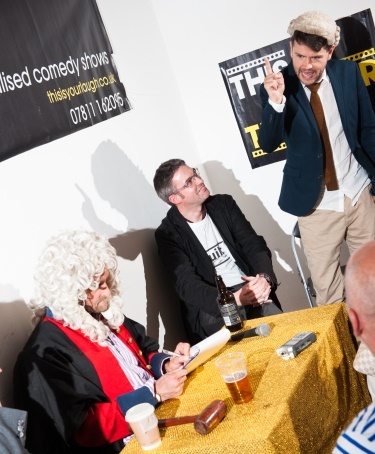 Star, and a surprise, witness for the Defence was 'Good Time' Charlie. A wooden giraffe from University days who wagged his tail for "yes" and stood still for "no". Charlie confirmed that Brian may have a little bit of ambition and want to be the best at everything but had no designs on the crown and deep down had a heart of gold, a jumper made of seabird oil and a bad haircut still. The prosecutions inability to control Charlie's tail resulted in their case beginning to crumble. "Inkster, Inkster, Inkster... where does this name come from... what does it mean?" asked Trevor Lock QVC. He called on Henry Von Stifle, a historian of the names of people who have funny names, to tell the Court where the name Inkster came from. Mr Von Stifle told the court that decendants of the Viking settlers in ancient Scotland were the first to use the name Inkster: derived from Ingsgar, a Viking Chieftain who settled in Shetland in the 9th Century. The court were told of Inksters migrating to Canada, America and Australia. Notable Inksters (other than Brian, of course) in recent times were the golfer, Juli Inkster, and Nigel Inkster, director of operations and intelligence at MI6. Suggestions were made by Barry Ferns QC that toppling the establishment from within MI6 might have been on the cards but evidence of Nigel Inkster having retired from MI6 quashed that idea. Just as well that Barry Ferns QC was unaware (and it was not brought out in evidence) of Nigel's new role, post MI6, as the Director of Transnational Threats and Political Risk at the International Institute for Strategic Studies! Trevor Lock QVC summed up by saying yes, yes Brian is a greedy man... of course he is. But greed is good. Brian provides work for the whole of Scotland from Inksters offices in Glasgow, Inverness, Wick and Portree. He is a provider of jobs, wealth and security for many hundreds of families throughout the fiefdom. "Not enough for the Bar" came a heckle from a real Advocate in the audience! Close encounters with Kylie Minogue and Natalie Imbruglia were also revealed, to much amusement, in the summing up. Barry Ferns QC produced evidence for the prosecution that showed a direct link between King James V of Scotland and Brian Inkster. Brian is in fact the 15th (in generations) great grand son of King James V of Scotland - see: Brian Inkster's Royal Lineage [PDF]. However, Brian pointed out that King James V of Scotland had nine illegitimate children so many others, perhaps some in the court room today, could claim the same lineage. Furthermore, being the youngest of a family of seven distanced somewhat any claim Brian may have to the Throne. Judge FitzHigham interjected "unless you killed them". Defence QVC, Trevor Lock, enquired nervously: "Brian, where are your brothers and sisters?" Brian was able to confirm having seen almost all of them alive and well the previous week when up in Shetland with the Scottish Ensemble. Brian's wife Nicola was called as the final witness. She described him as good fun but not perfect and sincerely hoped he did not have desires to oust the Queen. Then came the sentence in this complex case. 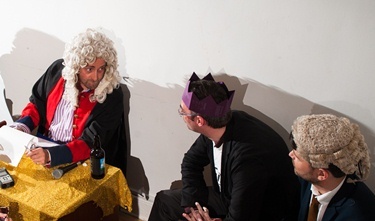 Judge FitzHigham, it transpired, was an expert in Udal law (which is more than could be said for the Defence and Prosecution QCs who didn't mention it once). The family tree evidence looked fairly legitimate. However, to use that to stake a claim to the throne of Shetland (the charges were beginning to crystallise) would be fairly sticky. Under the 1471illegal annexation of Orkney & Shetland under udal law King James V of Scotland would, of course, be the enemy as the usurper. As Brian Inkster is descended from a usurper he would be a usurper himself. That is where the case founders. So the charge of high treason was dismissed at this stage but the Judge did not rule out returning to it should Scotland become independent. By way of some form of compensation for aggrieved loss the court declared Brian to be King of Orkney! As Brian later tweeted: "Worse than being found guilty I have been declared by the Judge as King of Orkney!" Tim FitzHigham tweeted "one man's ideal compensation is another man's prison?" 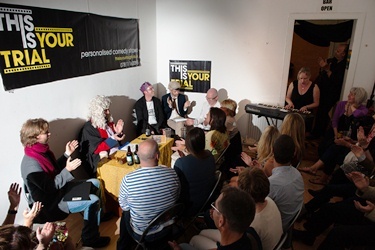 Jenny Beake, the court reporter, finished off the hearing with a song, written to the tune of 'King of the Road' that succinctly captured all the main points of evidence that had been brought out in the proceedings. 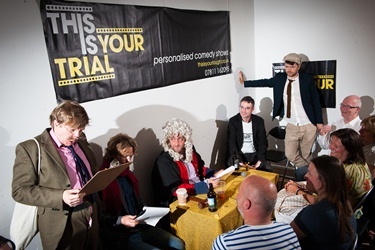 This is your Trial is the brainchild of David Allison, a law graduate, a writer, director and maker of films and TV. 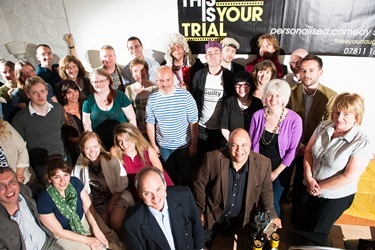 This Is Your Trial has been developed into a TV format and will hopefully be seen on your screens some time in 2014. Jenny Beake, inspired by the Trial, is writing a comedy musical on The Life of Brian (Inkster). Valerie Smith is washing the T-Shirt worn by Lewis Schaffer very thoroughly indeed. Nicola Walls is washing the Trial from her memory. Brian Inkster has returned to his day job as a solicitor at Inksters. Good Time Charlie is fighting off agents and offers. It is anticipated that he will have his own show at the Fringe next year, a TV show and a Hollywood career. Photo Credit: Photos by Simon Williams. 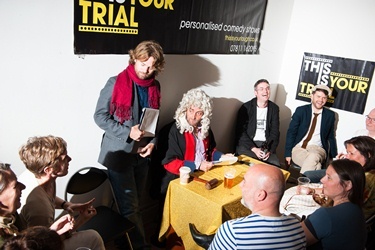 The full set of Simon's photos can be viewed at: Photos by Simon Williams of The Trial of Brian Inkster.